The headless horror under your bed, the Pugot Mamu.In the Philippines, there exists a headless, shape shifting creature that eats snakes and bugs through its stump, can move incredibly fast, and is harmless to humans. Legend says that this creature was a once a Friar who was beheaded and looking for his head. This, unfortunately is not the creature we are talking about. The Pugot Mamu, unlike its harmless counterpart, the Pugot, is a headless boogeyman that terrorizes children and devours them through its head stump. Like all boogeymen around the world, the Pugot Mamu serves as a warning to children to teach them to behave or the Pugot Mamu will get you and gobble you up. And with teeth like that, you better believe it. For my rendition, I was aiming to do multiple rows of different jaws for the Pugot Mamu, but that became problematic. I settled on giving it a kinda, lamprey sucker mouth and lined the interior with teeth. Bodywise, I originally was going for humanoid with the body, but then I read BPRD, and utilized the sloth-like clawed arms, and frog-shaped body to give the Pugot Mamu a more terrifying physique. 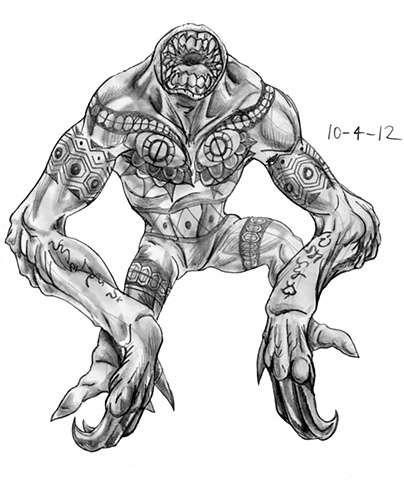 I incorporated Filipino tribal tattoos all around the Pugot Mamu's body, save for the eye tattoos, that was all me.